Islamabad: Pakistan will get a new team of lawyers to put forward its case vigorously in the International Court of Justice against letting off alleged Indian spy Kulbhushan Jadhav, media reports quoted a top official as saying. 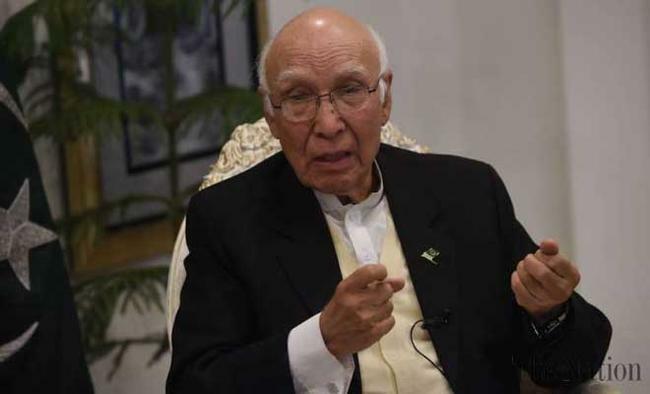 Pakistan's Foreign Affairs Advisor Sartaj Aziz told the media that Pakistan's counsel had courageously presented their stance in the ICJ, which stayed the execution of Jadhav - in a let-down for Islamabad. According to Radio Pakistan, Aziz maintained that the ICJ did not order Pakistan to provide consular access to Jadhav, but has merely put forward an opinion. Jadhav was sentenced to death by a military court here on charges of espionage and terrorism. Aziz said a decision to provide consular access to Jadhav is yet to be made. "Pakistan's security is so important and we have to maintain our fundamental sovereign right," he said. Pakistan Defence Minister Khawaja Asif told Pakistan Today that the issue of Jadhav concerns the nation's security and there will be no compromise on it. The minister said the "Indian spy" was convicted after fulfilling all necessary legal procedures and any decision on the matter will be taken keeping in view national security. "ICJ has only granted formal stay on the death sentence of Jadhav," he maintained.